Has anyone had Noon-o Panir-o Hendooneh? Or Hendevaneh, if you want to be proper! I was introduced to this delicious combination in my teenage years! My first thought was, “What??? That doesn’t sound too good.” Then I tried it and oh my was I hooked! My love affair with Feta cheese grows bigger and deeper every day. I just simply love it! I absolutely love watermelons as well so this is definitely a winner in my book! I think this is such a great combination and it’s a very nice summer snack or even meal when it’s hot out and all you need is something refreshing! 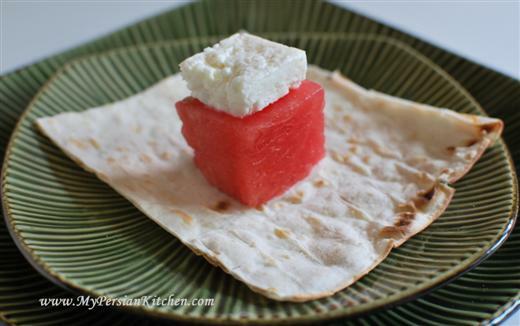 All you need for this delicious combination is Lavash Bread, watermelon, and your choice of Feta Cheese! Now run to the store and buy all three and put them together and see how delicious this combination is!!! This brings back memories. When I was a kid, we used to setup a sofreh on our living room floor for dinner every night in the Summer time and we would eat noon-paneer with hendooneh, toasted walnuts, sabzi khordan, khiar, and sometimes kharbozeh and/or angoor. It’s still my favorite summertime meal. So light and refreshing, and I think it’s the epitome of comfort food. Well, maybe next to ash-e shalgham. @ Zahra, thank you for sharing your memories! I totally agree, comfort food! But I would not say ash-e shalgam is comfort food for me, I have never liked shalgham! Never heard of this one! So excited to try this on the next hot day. I rarely turn the stove on over the summer months. And I am so sick of salad, sandwiches and take out. I must admit that the ingredients seem strange, but when I think of the different flavor combinations, I can see how they would work well in concert. Salty, sweet, creamy with a neutral base. In addition to watermelon, I think I’ll try it with cantaloupe. A Persian version of prosciutto with cantaloupe. Do not despair, you are not alone. I too have a feta thing going on. It’s getting to be a real issue. Apart from posting delicious Persian recipes, I think you may have missed your calling as a professional cookbook photographer. As always, keep up with the great site. Love it! Eric, as always thank you for your kind words! Your comments always make my day! Definitely try this combo! I would love to hear what you think of it! 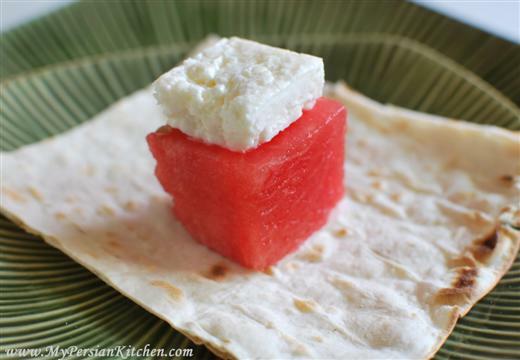 I had never heard about it, but must run to the International Market for lavash and feta cheese to compliment the watermelon in my fridge. I am headed to my kitchen right now to make this and impress my Persian husband and mother-in-law!!! You have brought long memories of this delicious treat we had as kids. Thank you so much for sharing with all of us these delicious recipes. I made this recipe today for a late afternoon snack. It has been hot, humid and rainy all weekend, so I figured I would take the opportunity. It was so delicious, clean and refreshing! My goodness. Thank you for the recipe. I tried it with cantaloupe as well, but the fruit was a little too sweet. I may have to up the feta next time. No problem! As an aside, I was talking with my Mom yesterday; she’s in Tehran. I mentioned your web site and this recipe. In my broken Farsi, I read “Noon-o Panir-o Hendooneh”. My Mom immediately understood and apparently it was my grandma Tamar’s favorite food. We reminisced about her for a while. It’s interesting and wonderful how food brings people together. Always allowing lots to talk about. It’s been all the craze on the cooking shows to have watermelon and feta salads. I’ve yet to try them myself. But it does sound interesting. I finally have a new post on my site, but I need to put it together. i love it. Summer times when i don’t want to cook any thing for dinner, we always eat feta cheese, lavash, watermelon, cucumber, tomato and grapes. The best summer time dinner, so light and refreshing. Love it when 3 ingredients come together like that! synergy! So nice to have met you, looking forward to getting together soon. Test kitchen coming up! you bring back sweet memories, this was my father’s favorite dinner. In Greece, watermelon and feta cheese is one of the most popular summer food combinations. They are eaten like a snack or a light meal… and raki go so well with them! I remember my grandfather eating this when I was a kid and insisting we try it saying, “you must try first” before we knocked it. He was Bulgarian and ate the Feta & watermelon with fresh baked white bread. My dad also eats’s it still today and I’ll have to try it again with the Lavash. It’s amazing how these ancient recipes have travelled through time and distance. I have just discovered you website and can’t wait to try some of the recipes. We used to go to one of the Caspian Sea Beachs called “deh nu” around 3 PM every day. Guess what we eat! We had a picnic with noon o panir o hendooneh . Some hot tea and sweets.